"All is fair in love? Even murder? That's the question in this adult, suspense-comedy about a love triangle in a Howard Johnson Motor Inn. Dr. Mitchel Lovell, D.D.S., played by Michael Mugnani, is the dashing dentist. He and Arlene Miller, played by Megan Kunz, the 'Femme Fatale,' plan to murder her husband Paul, a blundering used car salesman. Paul, played by Keith Write, conspires with Arlene to kill off her boyfriend! But wait! Now the tables have turned and it's the husband and the boyfriend joining forces to do Arlene in!" Whose murder is it anyway?? 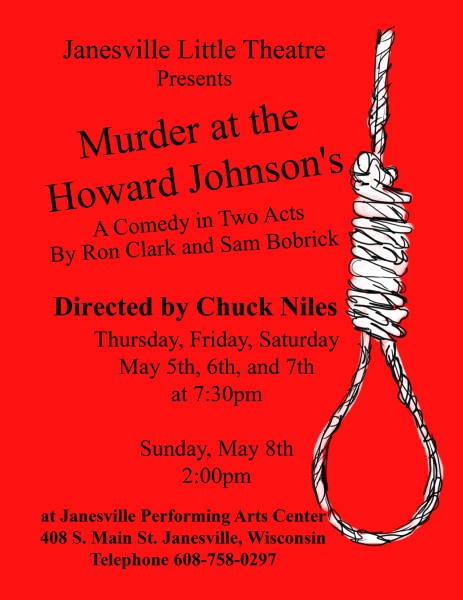 Murder at the Howard Johnson’s was written in 1979 by Ron Clark and Sam Bobrick. Ron Clark is best known for co-writing a number of screenplays with Mel Brooks. He partnered with Sam Bobrick on a number of Broadway plays the most famous of which were Norman, Is That You? and Murder at the Howard Johnson’s. Murder at the Howard Johnson’s opened at the John Golden Theatre on Broadway on May 17, 1979 and starred Bob Dishy, Tony Roberts, and Joyce Van Patten. Despite a short run on Broadway, the show has remained a fan favorite. Its quirky comedy plays well with modern audiences, perhaps even more so than when it premiered. We hope you enjoyed Murder at the Howard Johnson's.